Infants with Netherton syndrome (NS) typically display total body scaling with extreme redness or inflammation, similar to that seen in patients with severe atopic dermatitis. They also often develop severe allergic reactions to food. Symptoms are commonly present at, or shortly after, birth. In older children and adults, a unique pattern, termed ichthyosis linearis circumflexa, may develop in which wavy or serpent-like areas of redness bordered by (double-edged) scale are present. Some apparently less-severe cases may present with excess scaling, but little redness, a milder variant of NS, termed "peeling skin syndrome." The skin changes are typically accompanied by diagnostic defects in the structure of hair, called "bamboo hair" or trichorrhexis invaginata, in which the weakened outer hair shaft collapses over or into the lower part of the hair shaft. These hair defects are not always present and even when present, only 20-50% of hairs display the abnormality. Therefore, since the hair abnormality may be absent in some patients, or develop several years later, the diagnosis is easily missed. These patients often carry alternate diagnoses, such as "congenital psoriasis", LI, CIE, or "severe atopic dermatitis." Although the clinical features in infancy can be confused with psoriasis (see below), a key distinguishing feature is that thinning rather than thickening of the stratum corneum occurs, which should suggest the correct diagnosis. Certain electron microscopic features also are characteristic of NS. 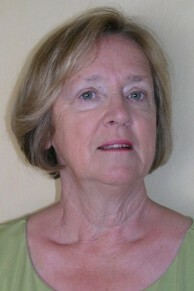 Patients with NS have a severe abnormality of their skin barrier (Fig. 1). When the skin barrier is defective, the body cannot retain its water, which is lost to evaporation. The barrier defect in NS may account for several other features of this condition. Infants with NS commonly have severe growth failure - initially with poor weight gain, later with lower rates of linear growth (height.) This growth failure appears to be due predominantly to loss of calories through heat of evaporation. When water evaporates, it carries with it energy or heat. This is why sweating cools the body - but sweating is regulated by the body in response to its internal temperature. The water lost across the skin barrier is not regulated by body heat and so to maintain body temperature, food calories (stored in the body as fat) must be burned to compensate for the heat loss. With a severe barrier defect - as in Netherton syndrome - an adult can lose as much as 1 ½ to 2 quarts of water a day with accompanying losses of more than 1,000 calories! Infants with NS also are at risk for severe infections, again in large part due to a defective barrier (bacteria and viruses can more easily get across the skin into the body), but also possibly due to deficiency of (from enzymatic [proteolytic] attack) certain antimicrobial proteins that protect against infections in normal skin (Fig. 1). There is also an increased susceptibility to develop warts (a viral infection) in NS; and rarely, these cases can progress to skin cancers. Finally, patients with NS are at risk for excessive systemic absorption of topical medications, such as Protopic®. 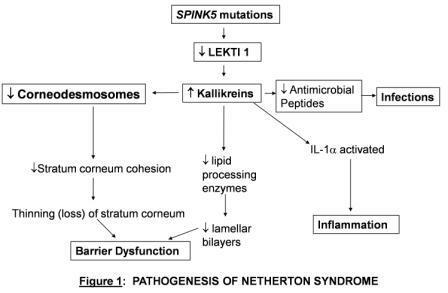 Netherton syndrome (NS) is caused by recessively-inherited mutations in a gene (SPINK), which encodes for a protease inhibitor, LEKTI. Loss of LEKTI results in a largely-unopposed attack on proteins by excess serine proteases on the epidermis (Fig. 1). A large number of different mutations have been described in NS, but all result in either absent or reduced LEKTI levels, and disease severity correlates with the extent of the increase in serine protease activation. Our recent studies showed that due to loss of LEKTI, attack by serine proteases can extend deep into the epidermis. Excess protease activity results in loss of stratum corneum (explaining the thinning, rather than thickening of the stratum corneum), as well as degradation of enzymes that generate lipids required for barrier function. Since the stratum corneum is actually thinner than normal, NS can be thought of as a type of "unthyosis" or "ichthyosis-not." It is likely that these over-active proteases also degrade antimicrobial peptides that are part of the skin's defense against invasion by bacteria and other microorganisms. This could account for the increased risk of skin and skin-derived systemic infections in NS. Because NS patients often present with a rash that resembles severe atopic dermatitis (eczema), we asked whether the same or similar pathogenic mechanisms could be operative in atopic dermatitis (AD) (Figure 2). Indeed, an increased incidence of SPINK5 mutations (single nucleotide polymorphisms, SNPs) has been noted in some families with atopic dermatitis and asthma. Moreover, as in NS, serine protease activity is increased in atopic dermatitis. Currently, AD is considered an inherited disorder of barrier function, in which allergens more readily cross the stratum corneum, eventually provoking the characteristic immunologic features of AD (it starts as the most common type of ichthyosis, ichthyosis vulgaris, IV). Similarly, the allergies in NS likely derive from increased penetration of allergens across the defective skin barrier. Therapies that reduce serine protease activity or decrease surface pH (acidification) hold promise not only for the treatment and prevention of AD (Hatano, Y, et al., 2009), but also for NS (Fig. 2). These approaches could also help to prevent progression of IV to AD. Chavanas, S, Bodemer, C, Rochat, A, Hamel-Teillac, D, Ali, M, Irvine, AD, Bonafe, JL, Wilkinson, J, Taieb, A, Barrandon, Y, Harper, JI, de Prost, Y and Hovnanian, A. (2000) Mutations in SPINK5, encoding a serine protease inhibitor, cause Netherton syndrome. Nat Genet 25:141-2. Descargues, P, Deraison, C, Prost, C, Fraitag, S, Mazereeuw-Hautier, J, D'Alessio, M, Ishida-Yamamoto, A, Bodemer, C, Zambruno, G and Hovnanian, A. (2006) Corneodesmosomal cadherins are preferential targets of stratum corneum trypsin- and chymotrypsin-like hyperactivity in Netherton syndrome. J Invest Dermatol 126:1622-32. Elias, PM, Hatano, Y and Williams, ML. (2008a) Basis for the barrier abnormality in atopic dermatitis: outside-inside-outside pathogenic mechanisms. J Allergy Clin Immunol 121:1337-43. Fartasch, M, Williams, ML and Elias, PM. (1999) Altered lamellar body secretion and stratum corneum membrane structure in Netherton syndrome: differentiation from other infantile erythrodermas and pathogenic implications. Arch Dermatol 135:823-32. Hachem, JP, Wagberg, F, Schmuth, M, Crumrine, D, Lissens, W, Jayakumar, A, Houben, E, Mauro, TM, Leonardsson, G, Brattsand, M, Egelrud, T, Roseeuw, D, Clayman, GL, Feingold, KR, Williams, ML and Elias, PM. (2006) Serine protease activity and residual LEKTI expression determine phenotype in Netherton syndrome. J Invest Dermatol 126:1609-21. Hatano, Y, Man, MQ, Uchida, Y, Crumrine, D, Scharschmidt, TC, Kim, EG, Mauro, TM, Feingold, KR, Elias, PM and Holleran, WM. (2009) Maintenance of an acidic stratum corneum prevents emergence of murine atopic dermatitis. J Invest Dermatol 129:1824-35. Moskowitz, DG, Fowler, AJ, Heyman, MB, Cohen, SP, Crumrine, D, Elias, PM and Williams, ML. (2004) Pathophysiologic basis for growth failure in children with ichthyosis: an evaluation of cutaneous ultrastructure, epidermal permeability barrier function, and energy expenditure. J Pediatr 145:82-92. Voegeli, R, Rawlings, AV, Breternitz, M, Doppler, S, Schreier, T and Fluhr, JW. (2009) Increased stratum corneum serine protease activity in acute eczematous atopic skin. Br J Dermatol 161:70-7. Walley, AJ, Chavanas, S, Moffatt, MF, Esnouf, RM, Ubhi, B, Lawrence, R, Wong, K, Abecasis, GR, Jones, EY, Harper, JI, Hovnanian, A and Cookson, WO. (2001) Gene polymorphism in Netherton and common atopic disease. Nat Genet 29:175-8. Weber, F, Fuchs, PG, Pfister, HJ, Hintner, H, Fritsch, P and Hoepfl, R. (2001) Human papillomavirus infection in Netherton's syndrome. Br J Dermatol 144:1044-9.